Acupuncture for knee pain. Our focus is on helping to eradicate the pain, and to work at preventing it from recurring. Whether you have 20 year old knees or 60 year old knees, knee pain is never welcome. 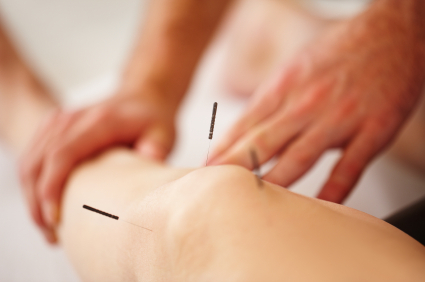 Acupuncture has been used for centuries as an treatment for muscular and joint pain, including knees. In order to help restore a healthy flow of Qi ( energy ) through the channels which traverse the knee, we use acupuncture, electro-acupuncture, massage, heat lamps and liniments . Whether you’ve injured your knee as a weekend warrior or have been suffering with knee pain over many years, we might just be able to help. Please feel free to pick up the phone and talk with me about how acupuncture and massage can help with your particular injury or ailment. Below are some abstracts from recent research into the use of acupuncture for knee arthritis and/or knee pain. We’re always happy to talk with you about how this research may relate to your condition and how acupuncture may help you.